Click the image to the left to view calendar. Welcome to the Sanford Historic Trust inaugural calendar of historic places and beautiful scenes of Sanford, Fla. We hope this will evolve into an annual calendar highlighting the different neighborhoods throughout the City of Sanford. A great deal of effort went into developing this calendar with special thanks going to Kathy Hull and Reg Garner. Starting with a great idea and armed with enough pertinacity, Kathy made the first Trust calendar a reality. With his professional photography expertise, Reg organized the photo contest through the Orlando Camera Club. The contest was open to all and that diversity shows in the winning pictures. The Trust would like to thank our three calendar sponsors, whose generous contributions made our first, of many more, calendars possible. Many thanks, Center State Bank, CCS Restoration and Insurance Risk Services. 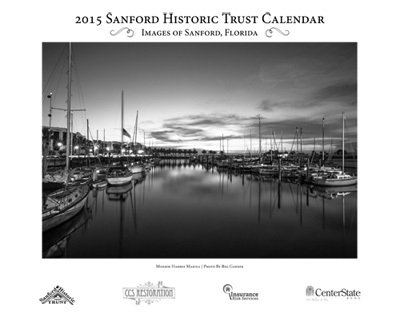 The calendar photos show houses, buildings and places from all over Sanford. The black and white images offer a nostalgic view of Historic Sanford. The Sanford Historic Trust is a non-profit organization of neighbors and citizens concerned with maintaining the integrity of Sanford’s Historic District through various projects and events, which help bring awareness to the Historic District, and its significance to Sanford’s history. With our annual Holiday Tour of Homes, the continuing lecture series, the street lighting program, the historical markers project, the Downtown Tourist Fun Map, and now with this beautiful calendar, we hope you will continue to support the Trust with your kind contributions and participation.